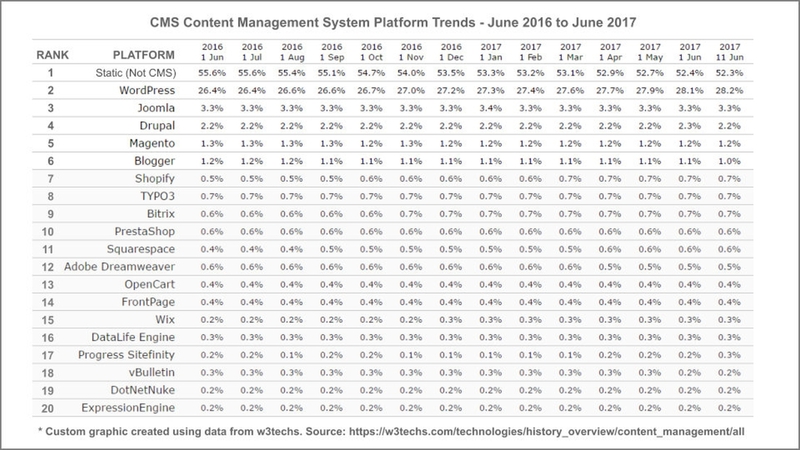 The “Top 20 CMS Trends in 2017” report data from June 2016 to June 2017 shows 28.2% of all websites worldwide use WordPress. Our custom graphic lists the top 20 from w3techs.com. View their website for current data of CMS trends for 50+ platforms. As of June 2017, 52.3% of all websites are static design with info only content that the owner will rarely if ever change. Nearly 48% of sites worldwide are a dynamic Content Management System, or CMS. WordPress dominates all the others combined. View market share in our graphic. The Top 20 CMS Trends for 2017 show growth for WordPress and the rest flat or dropping. Our business is mobile friendly web design, and since 2012 our recommended CMS platform of choice continues to be WordPress. WordPress is ideal for online stores or a blog where owners can add, edit, or delete content from a secure admin backend. The sophistication of the CMS is complex with 2500+ files that include WordPress core files, a theme, and plugin addons. A surge of hacker activity in 2016 was devastating for many website owners, and continued with CMS security risks in 2017. WordPress popularity makes the CMS a primary target of hackers. The platform is secure. The #1 problem is website owners. Every CMS platform releases updates that enhance performance or security. The majority of owners do not install updates. Here are the 2016 percentages hacked because of outdated software: WordPress 61%, Joomla 84%, Magento 94%, and Drupal 86%. Security is urgent. From February to August 2016 we developed and implemented a security plan to further protect clients. Later, from October 2016 to February 2017, we developed a simpler static design option for clients who do not need a CMS. The static mobile RWD option is a simple flat HTML design. The dynamic CMS uses advanced php which hackers will target. WordPress hacker risk is 40% even if files are kept up to date. It’s 61% risk with outdated software (see graphic above). Our security and maintenance monitoring works. From October 2016 to June 2016 zero websites we monitor have been hacked! If you do not need a WordPress CMS, the HTML of our static mobile RWD is not a target for easy hacking. The risk? Less than 1%. Summary: The Top 20 CMS Trends in 2017 show WordPress is THE leader. Don’t need a CMS? Call us about static mobile RWD.